For his 7th Birthday this year, Owen wanted to have a bowling party. The lanes where we chose to have the party supplied everything but the cake. 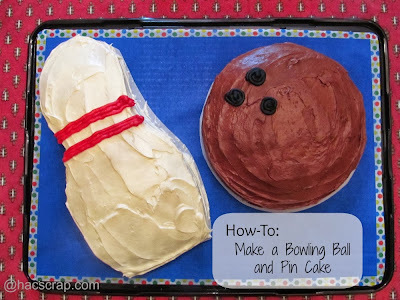 So I set off to figure out how to make a bowling ball and bowling pin birthday cake, and now I am sharing that with you. Let me start by telling you I am not a talented baker. I can follow a recipe, I can operate a pastry bag. . .but the Cake Boss has nothing to fear from me. But this is relatively easy, so take a deep breath, and let's get started! You'll need an 8" round cake pan and a 13" x 9" rectangular cake pan for these cakes. 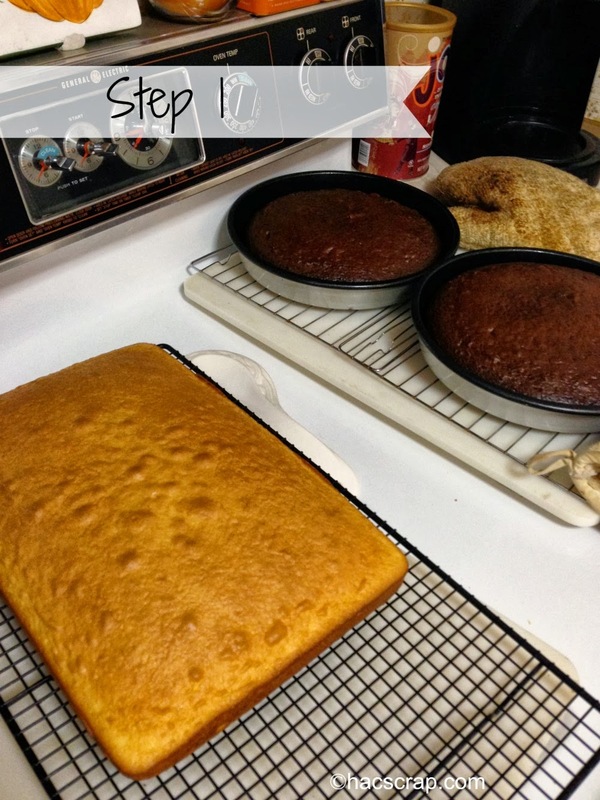 Step 1: Bake your cakes. I used box mixes, and decided to make a chocolate bowling ball and vanilla (yellow cake) bowling pin. Let them cool completely. 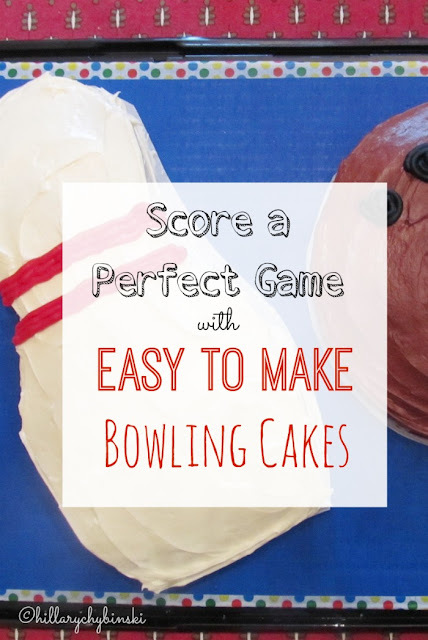 Step 2: Make life easy for yourself and use the round cake as it is for the ball (you can layer it it you want, I kept a single layer) Get a template (no taller than 13") of a bowling pin. I searched online and printed one out. You can also free-hand. 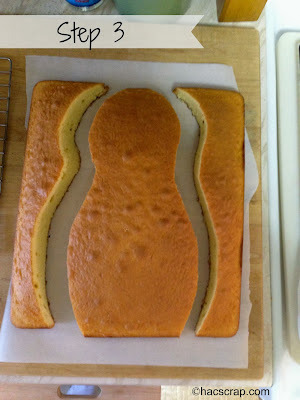 Step 3: Use your bowling pin template to cut your white cake. I stood on a stool, so I was up over the cake. 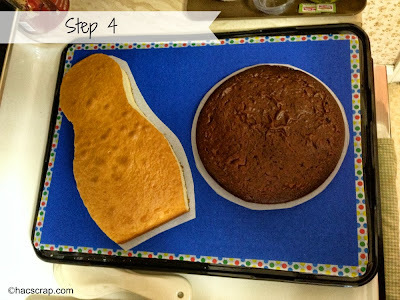 Put your cake on a hard, flat surface (you can lay a piece of parchment down) and use a serrated knife. Take small cuts, following your template. Step 4: (optional) Use your template to cut a piece of parchment paper, just a little bigger than your cake. You can also just cut around your cake if you put it on parchment to cut. I also traced a white paper plate onto parchment for my bowling ball. I put these on my "tray" to help arrange my cakes for transport and display. Step 5: Place your cakes on your tray and ice. These cakes were relatively easy and such a hit. Wondering what shape I should try next. . .
Would it be terrible to use a 9" cake pan instead of 8"? Karen - that would totally be ok! Oh what a fun idea!! We had a last minute bowling birthday party for my son when it started raining on his pool party! 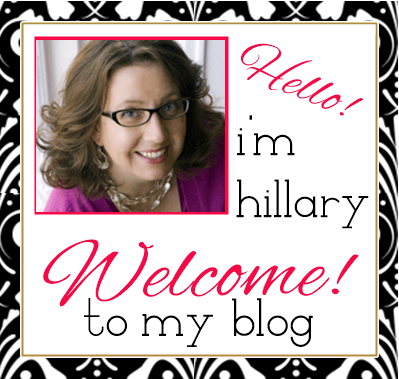 Hi Hillary! Love this cake, going to attempt to replicate it tomorrow. Question for you - how much icing did you use for the bowling pin? Is one container of white frosting sufficient? Also, do you recommend buying black and red icing for the details, or food coloring on white icing and then pipe it yourself? 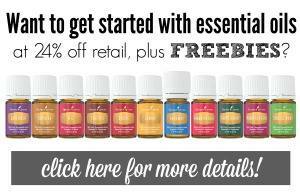 Hi Della - I went to your blog to try and contact you directly - hope you see this! I have NO IDEA how much icing I used. . .I probably had one vanilla and one chocolate. I used a tube of piping icing for the red and black - it was just easier. Good luck!! Hi, Did you use just one 8" layer of the round cake for the bowling ball? There are two cooked layers in the first picture and the ball looks higher in the last picture. Just want to be sure I have enough ingredients if it should have two layers.